Nicole Richie and Joel Madden have traveled the world, partied at exclusive clubs and signed autographs for adoring fans. So what impresses them these days? But there are tough new challenges ahead. In late March, Joel left for a Good Charlotte tour that will take him throughout Europe through mid-April. Nicole and Joel can’t wait until he’s back so they can resume their routine. Meanwhile, are wedding bells in Nicole and Joel's future? The two attended the wedding of Good Charlotte guitarist Billy Martin and longtime girlfriend Linzi Williamson on March 1. During his toast, Joel joked that "[They] beat us on the marriage, but we got you beat on the baby!" And, as Life & Style has reported, the duo have hired a wedding planner who’s scouting locations in LA. “Nicole and Joel are totally in love,” the couple’s pal, American Idol host Ryan Seacrest, tells Life & Style. And they’ve got Nic’s dad, singer Lionel Richie, behind them. “Lionel says that if Nicole were to take the next step, he would advocate that,” says Ryan. 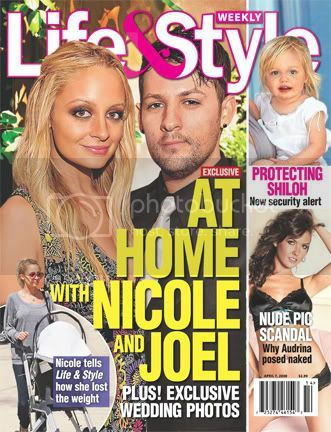 To read more about Nicole and Joel’s family life, pick up the latest issue of Life & Style, on newsstands now! I will be looking out for scans to post. WOW, I am totally suprised that they have hired someone to start planning the wedding, it is brand new news to me, i'm so happy for them and i am already looking forward to seeing Nicole Richie's wedding dress!